Make a traditional look different through accessories! Plaid is one of the trendiest prints this Fall and Winter. It's been a big trend since last year, but what’s different this year are the different plaid patterns. There are many more plaid items available in stores, making easy for consumers to wear this trend. Plus the colors and plaid pattern sizes are more interesting now. I've always associated plaid with being a preppy print- something worn for uniforms at a private school. Anyone else? But today, in modern times, the pattern is much more of a trend driven print. A classic plaid mini is one item that will be in style for decades and make a return at least once in your lifetime. You can style it in several ways too. For this look, I went the preppy route with a boyfriend oversized button up and tweed blazer. You can also wear this plaid mini with a sweater and over the knee boots for a totally different look! My tweed blazer is a few years old but it’s one of those classic pieces that never goes out of style. It can be dressed up or worn casually. I’ve linked a few great options for you below! A super easy tip to make a pair of pumps look ten times cooler is to wear a pair of fishnets with them! It automatically gives the illusion that you are wearing booties but, in reality, you’re not. It is also a really inexpensive to achieve the look of wearing boots. Adding fishnets to a preppy look gives it an edgy feel instead of looking so uptight. A good leather bag is even better when it has amazing metal details! I love this Evve Milano bag because it fits everything I need plus it is super stylish with high end metal and crystal finishing. This bag is versatile- wear it during the day to work and out for drinks into the night. You can shop the bag HERE and it also comes in white which is great for summer. See some other ways I have styled plaid here, here, and here! 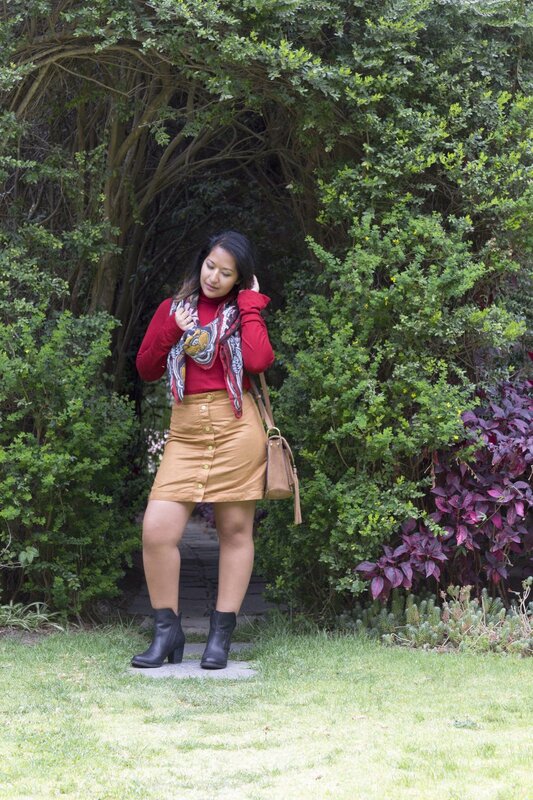 Earthy colors for fall are a must! I love the rich warm tones of carmel and paprika. I especially love the two colors paired together. They are individually such powerful colors but together they create a really interesting palette. Another fall favorite of mine are the fall fabrics! Everything from suede, wool, to furs! The a-line skirt shape has been a big trend this year. I actually work this skirt in the summer several times. See the other looks here and here. I love when I can wear a piece of clothing multiple times through different seasons. For fall, I thought pairing this suede skirt would be great with a soft drapy knitted turtleneck. For accessories, I added my favorite cross body fringe bag and the scarf to pull all the fall colors together. Adding a print or patterned item to a look with multiple solid colors helps bring in everything together. Black booties are always a classic staple to own. These black leather booties are not only fashion forward, they are comfortable, water resistant, and made so well! It's really hard to find a pair of boots that are worth investing in. CAT is known for their well made construction equipment- well their shoes are just as good! Trust me! Mini skirts are back in trend and in a major way. From aline shapes in suede to denim cutoffs. It's a key piece to purchase because you can wear it now and transition it into fall as well. This ribbed knit black criss cross tie top is great because it goes with just about everything! It also gives the look an extra touch to take an outfit to the next level. You can pair this top with a skirt, jeans, and even layer on top of it. These two pieces, skirt and top, look good together or can be worn separately and still look great! That is something I always think of when I buy clothes. I immediately create outfits in my head and see how many looks I can create. Chokers are a jewelry trend that I'm completely obsessed with! It's so simple and can totally change a look. It's super easy to make! The velvet choker I'm wearing here is a piece of ribbon tied in the back.